I've tried so many recipes for making naan @ home, but nothing gave me this much satisfaction as this one gave.. I's really very happy when I made this naan as this one is a fool proof recipe.. All the credits to Raji of Raks Kitchen.. Believe it or not,the recipe doesn't involve much work but the final outcome is almost close to restaurant style but homemade. 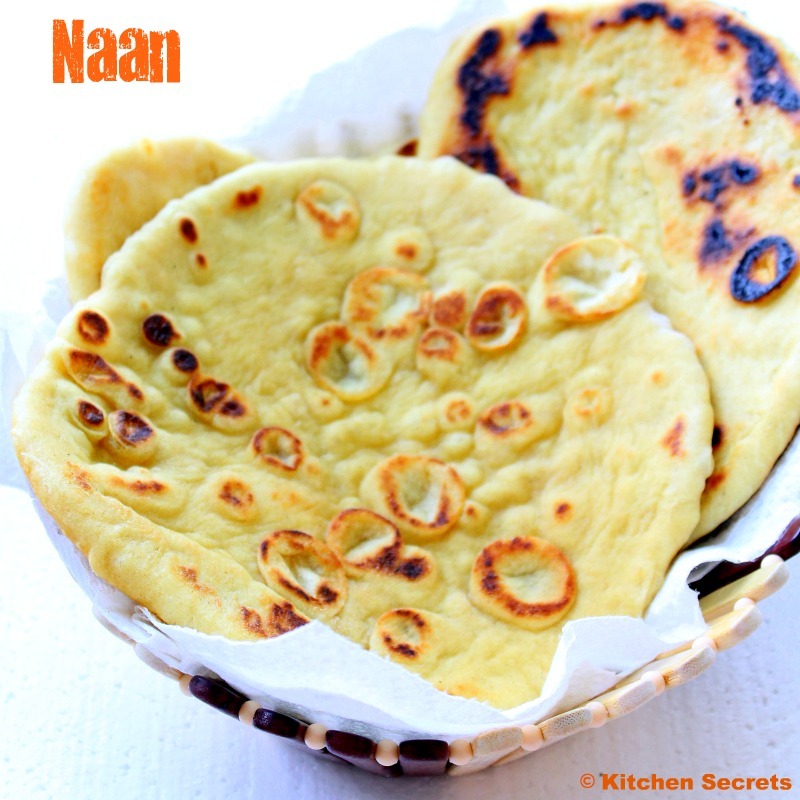 If someone is really interested n trying very hard to make a good naan at home, guys, u should give a try to this recipe.. Mix the flour with the wet ingredients and form a soft dough , do not overwork the dough. 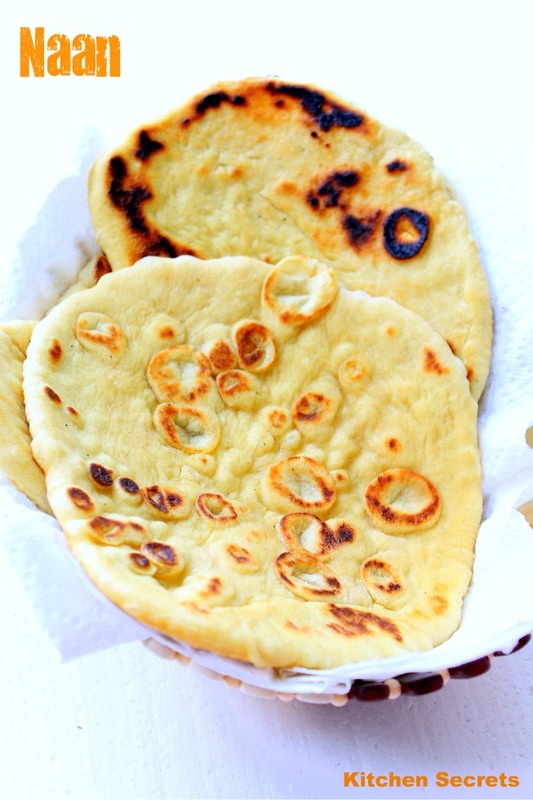 Cover the dough with a moist cloth and rest for 3 to 4 hours, the more u rest the dough , better the naan would be. Dust ur working area and start kneading the dough . Knead for 2 to 3 minutes. Then later diivide into equal sized balls. In the meantime, heat ur dosa tawa /iron cast pan to a high temp. Now start rolling ur naan and while doing ,don make it too thick. U may roll a tear shaped ,( official shape of Naan ), rouns shape, square..whatever..acc to ur ease. Now wet ur hand and apply it on the top of the naan, fully covered . Remove the naan from the working space and carefully place the water side down on the hot tawa. Cover the tawa immediately. ( Now cook in medium flame ) It would puff and raise on most of the parts when u open after a minute. Now u may flip the naan to the other side on the tawa itself ( thatz what I did ) else u may turn the tawa upside down and cook the top portion of naan and then remove it. Do not forget to increase the heat when ur tawa is not hot. Repeat for the remaining dough left. serve hot with butter chicken (perfect combo for non veg lovers) else go with paneer makhani..
Cashews -- 4 to 5 nos. Cube the paneer and put it in the slightly hot water. Heat a sauce pan with 2 tsp of oil and add in the cloves, cinnamon, cardamom, Bay leaves . Stir in for a couple of minutes. later add the grated ginger and scald well. Then add the green chillies and fry them too. Finally add in the chopped tomatoes and fry them as well. Stir the whole mixture for 2 minutes and later add a cup of water . Cover and cook the mixture for 4 minutes / until the tomatoes are cooked and turned a gravy consistency. Switch off the heat and let the tomato mixture cool down for a bit. Now fish out the cardamom , cloves , cinnamon and the bay leaves. Blend the remaining mixture to a puree. Bring the puree to a boil and simultaneously grind the cashews to a fine powder and add little bit of water to make a fine paste. Add a tbsp of tomato paste once the sauce starts boiling and mix well. Look for no lumps.Then dump in the cashew mixture to the boiling sauce and mix well. Stir in the red chilli powder ,salt and mix well. Let the sauce cook well and the raw smell of the red chilli powder be gone. Finally add in a tbsp of honey to the sauce. Combine well. Add the soaked paneer cubes. Bring the heat to medium low and after a minute , pour in the cream/ milk.Add the butter and combine everything well. Sprinkle the kasoori methi on top of the sauce and switch off the heat. Let the paneer makhani in the dum for few minutes. Serve hot with roti's / Naan. Naan is looking just awesome. a great combo dear. both looks fabulous dear....so colourful and delicious. Nice combination of naan and paneer makhani.They complement eachother so well.Fabulous and yummy feast. naan looks perfect n yummy paneer dish! super yum combo and lovely clicks ! Bookmarked!!! 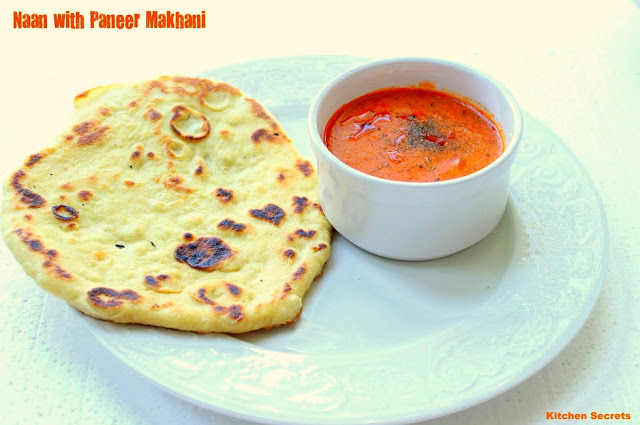 Soft, yummy naans with this even-better-than restaurant paneer makhani...Mind blowing!!! சூப்பர்ர்ர் ஷானவி,2 ரெசிபிகளும் அட்டகாசாமா இருக்கு.பகிர்வுக்கு நன்றி!! I m impressed..gorgeous clicks with yummy recipe dear..
wow both recipes are too gud and wonderful combo...done it perfectly. Favorite combo in restaurants... loving your pics!! Both looks mouthwatering,perfect combo..delicious meal. Awesome combination n perfect for dinner..perfectly n prepared looks fab..
An unbeatable combo! 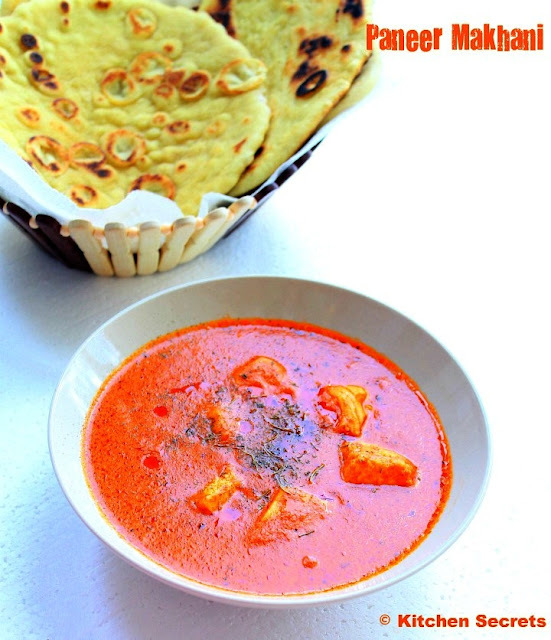 The paneer makhani looks stunning ~ such a bright, rich orange color! Its so divine Shobana, Looks delicious and making me hungry. Thanks for your entry dear.. This is so divine..lovely presentation..stunning pictures..
Naan without yeast and paneer makhani looks delicious.